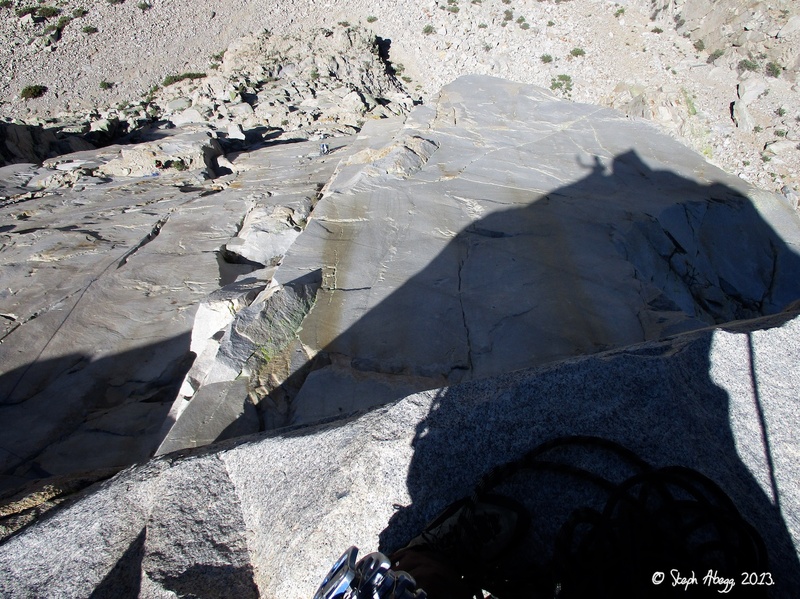 In September 2013, I climbed the popular West Face route on Cardinal. 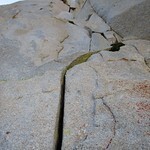 I was impressed with the high quality of the granite, and I made a note to return someday to climb another route. 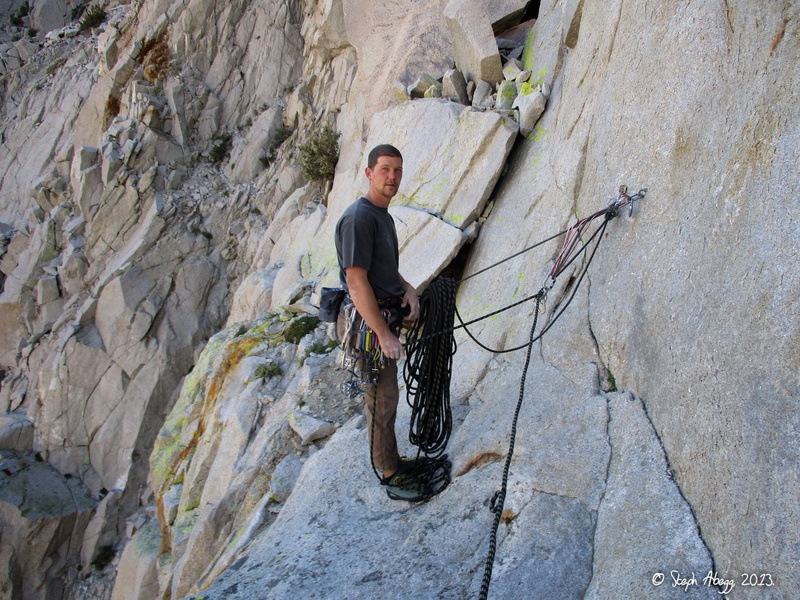 That day came in August 2015, while on a climbing roadtrip to the Sierra, I met up with another road-tripper named Brian to spend a day climbing on Cardinal Pinnacle. 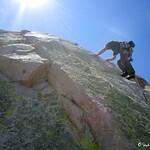 The main objective of the day was Crack Kingdom, a 550' route to the top of the Pinnacle. 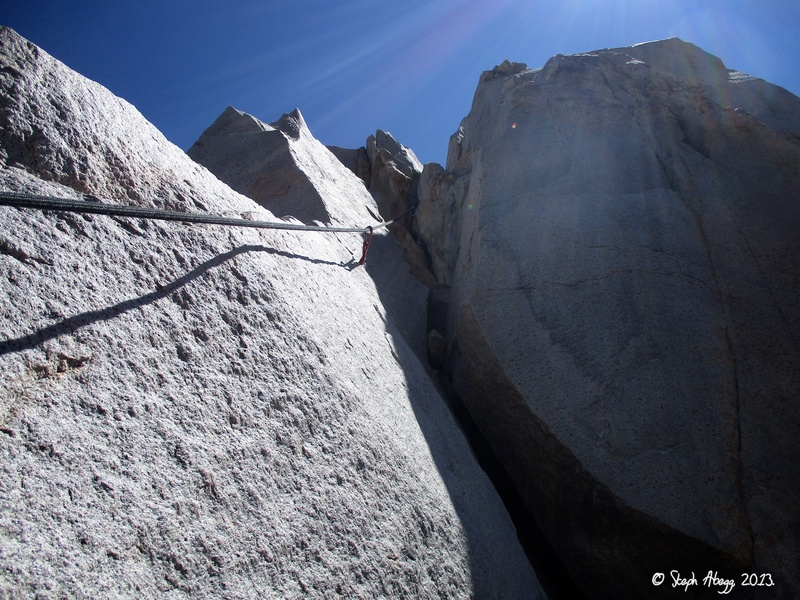 Crack Kingdom is a combination of the original routes Crack of No Hope and Wild Kingdom, and shares the same first pitch as the West Face route. 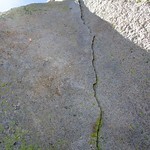 Crack Kingdom features cracks of all sizes, highlighted by the 3rd pitch finger crack. The main four pitches of this excellent route are 5.10 (5.10a stepover and fingers, 5.10b OW, 5.10c fingers, 5.10b lieback). Brian and I swung leads: Brian led Pitches 1 and 3 while I led Pitches 2 and 4; we both climbed Pitch 5 to the airy summit on a belay. 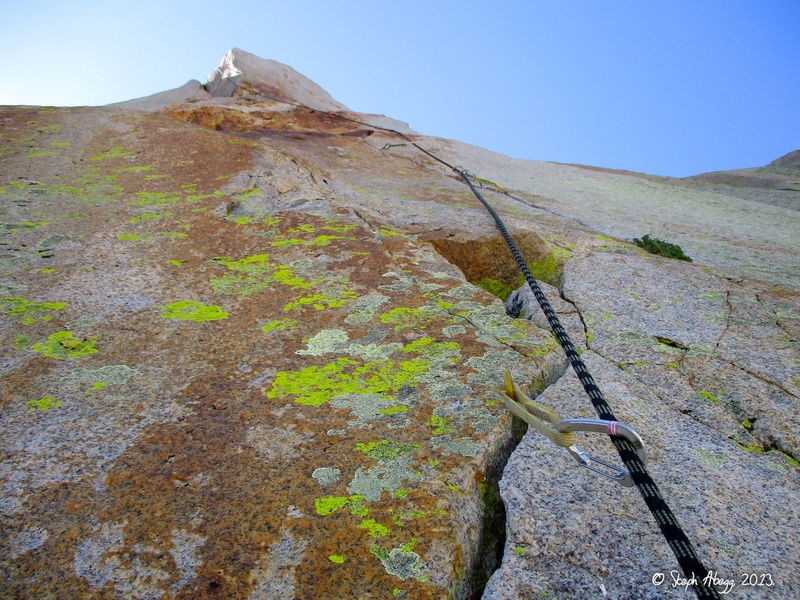 After climbing Crack Kingdom and rappelling down the Pinnacle, we finished off the day by climbing V8 Crack, an 80' splitter crack system on a little crag just left of the main Pinnacle. 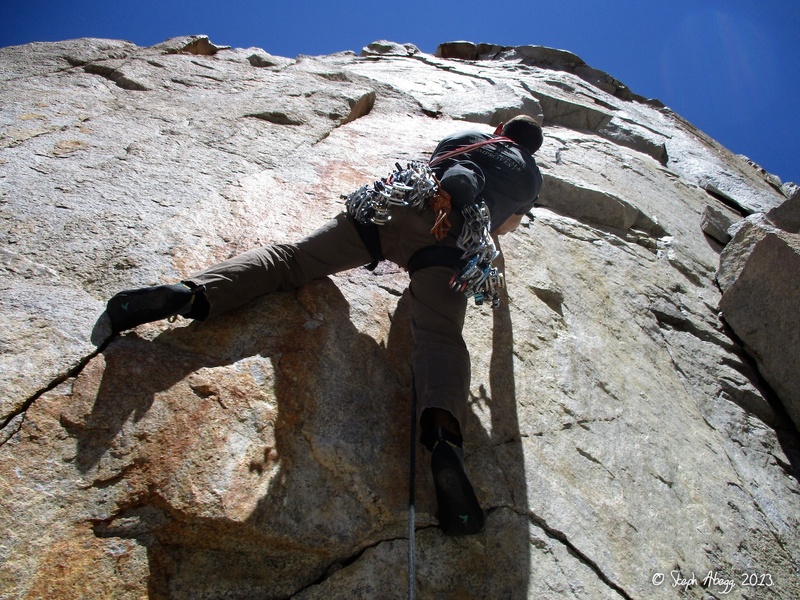 The pitch is sustained and steep, starting with a juggy finger and hand traverse with pasty feet and turning into a gradually widening crack that splits several small roofs. The location of the 10d crux depends on your hand size. Brian led this pitch (onsight!) and then I proceeded to clean it and lap it once. Brian and I had such a fun day we made plans to meet up and climb some more while our road-tripping schedules overlapped. The following page contains a couple of overlays and photos from the climbs. 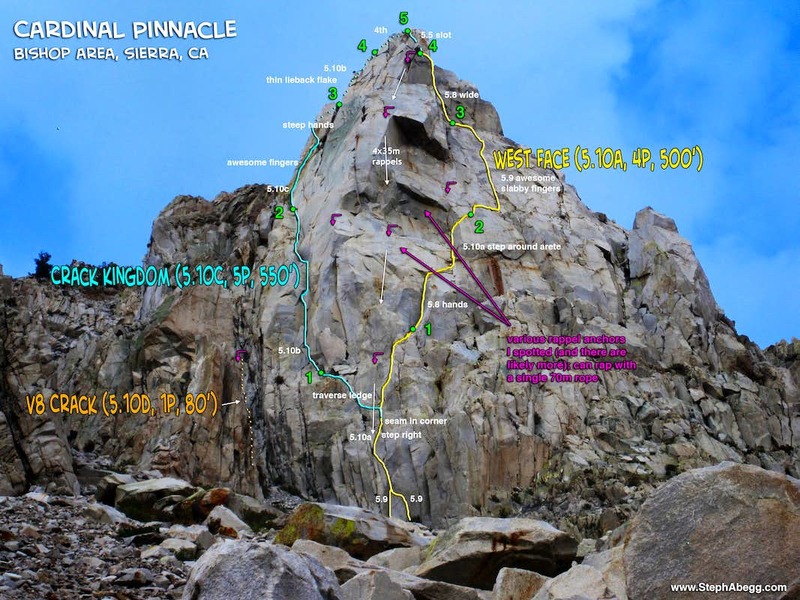 (shows Crack Kingdom, a side profile of V8, and the popular West Face route which I climbed in 2013). Approach From Bishop take HWY 168 west about 15 miles. One mile after passing through Aspendell, Cardinal Pinnacle is on the left. 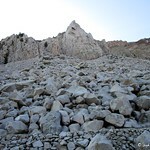 Park below it and scramble 20 minutes of talus to the base of the crag. Crack Kingdom is located on the northwest face (left side) of the Pinnacle. Find the 15 foot block/flake at the base with finger cracks in both sides to start. 1. 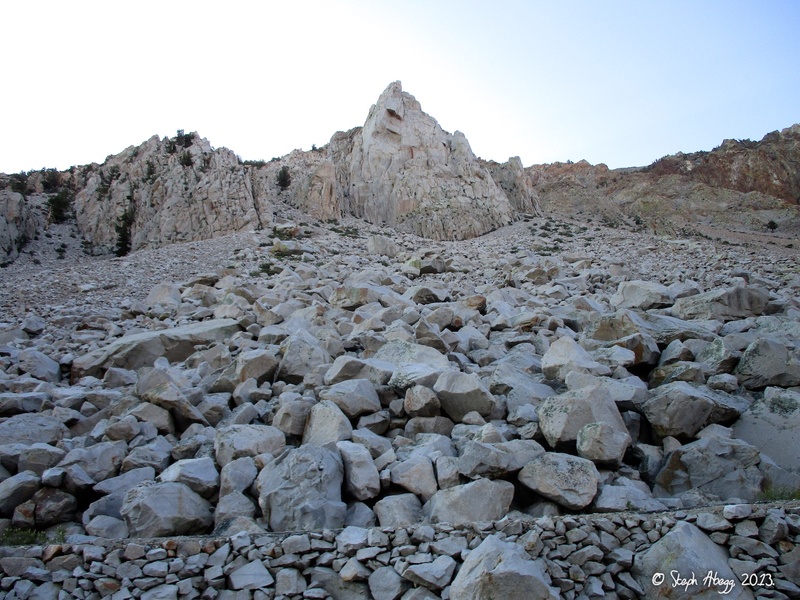 Cardinal Pinnacle as viewed from the road, with the talus approach in-betwen us and the great climbing. 10a. 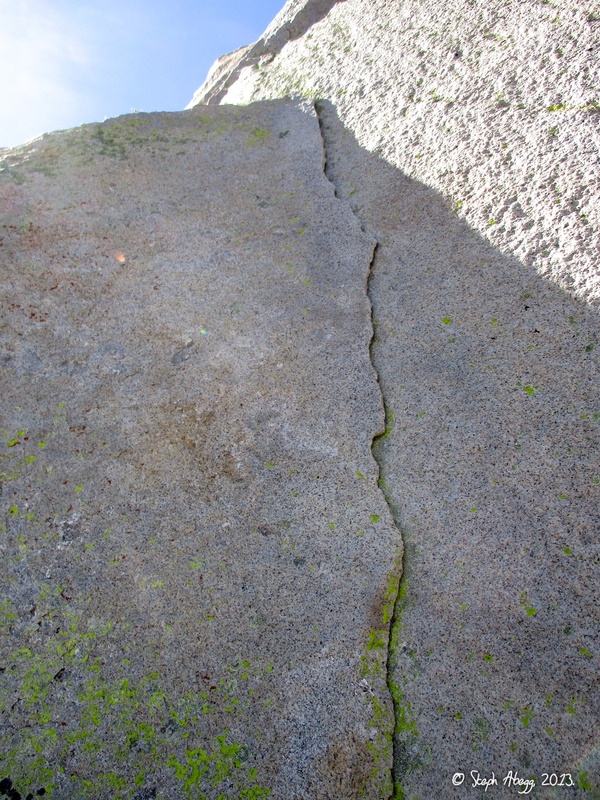 First pitch of West Face: Climb the left or right side of a block to a ledge continue up corner cracks past a pin and then step right to another crack which leads up and right to a very thin crack in a corner which leads to a big ledge. 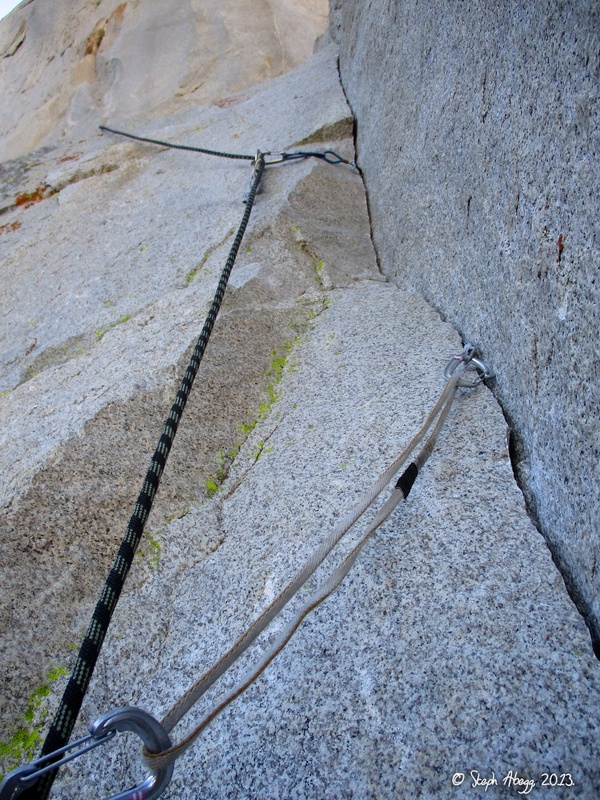 Instead of going rightwards to the bolt belay for the West Face route, traverse 25 feet left on ledge to base of obvious cracks. 2. Brian starting up Pitch 1. This is the left-start option, about 5.9 (right start option is just about 10 feet to the right and is also about 5.9). 3. 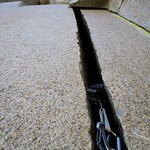 The thin crack in a corner just before the big ledge. Hint: Look for the features on the face for the feet. 4. Brian at the bolted belay on the ledge. 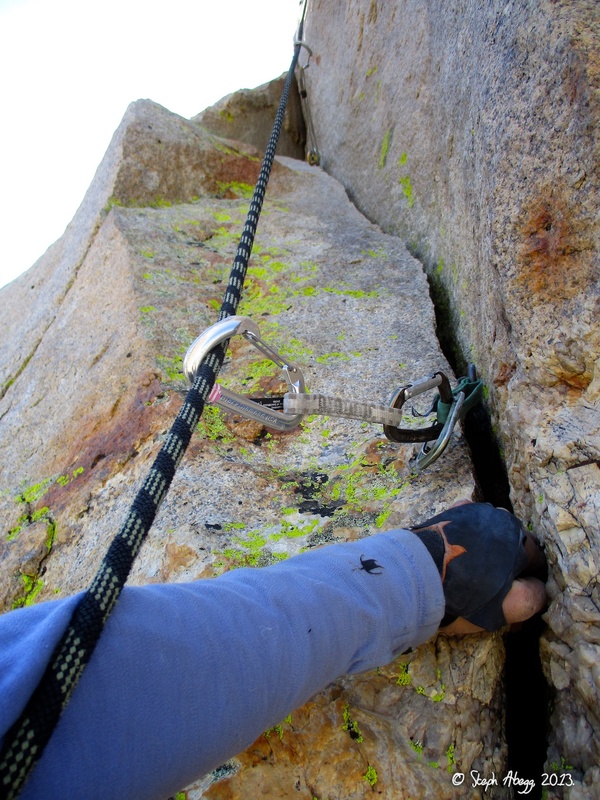 To avoid ropedrag, it's a good idea to set the belay here and then to have the follower move the belay over to below the Pitch 2 crack. 10b. 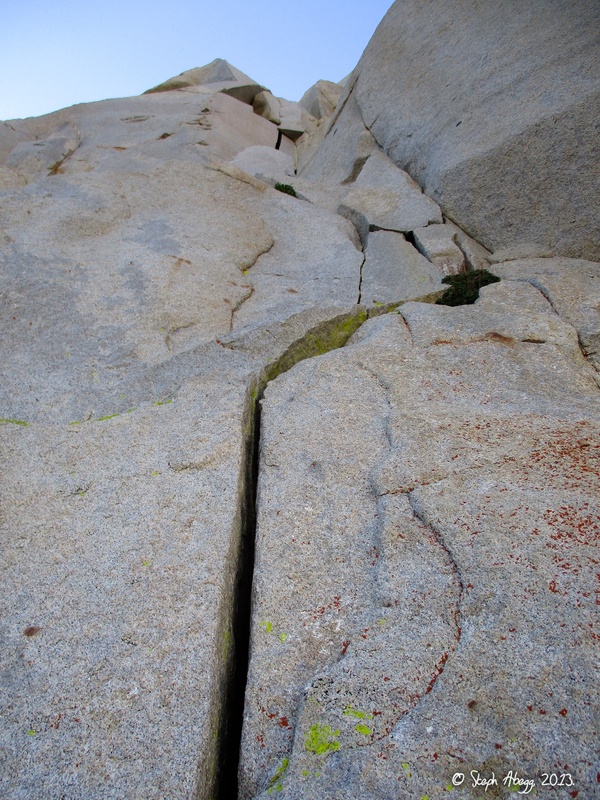 Up cracks, a short chimney behind a block and on up through a short steep #4-sized razor crack to an awkward offwidth roof/squeeze (crux). 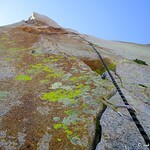 Continue up the easy chimney to its top and step around left to belay beneath a left facing corner. 5. Looking up Pitch 2 from the ledge below. 6. The #4-sized razor crack. 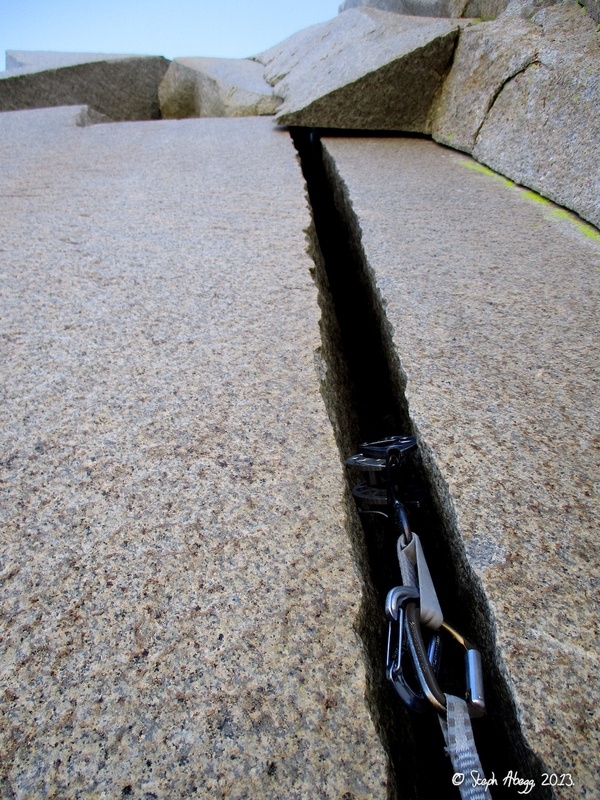 There's more than one account of a climber getting his or her knee stuck in this crack. Don't wear shorts. 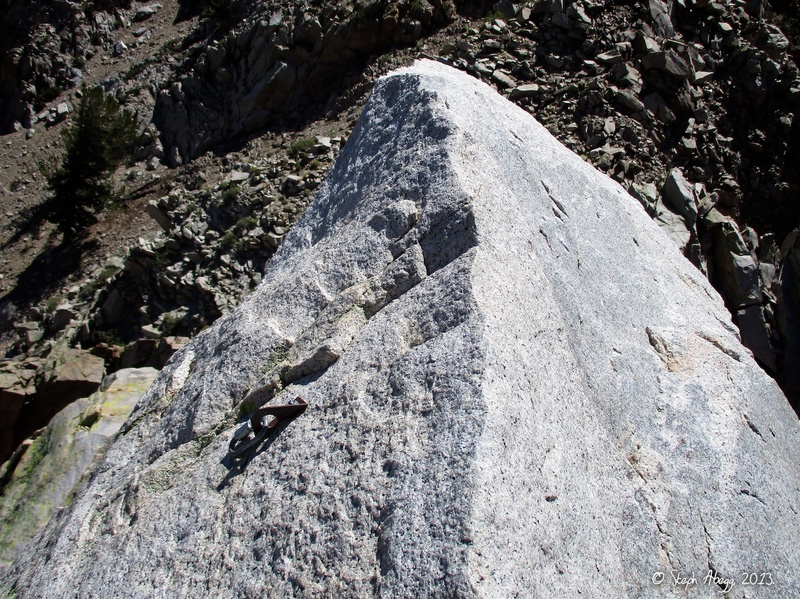 I led this pitch and found this offwidth crack to be a bit harder than the offwidth section above, but I think I could have made it easier if I committed to the knee jam. 10c. 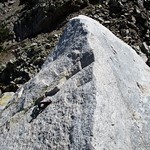 Up the corner into a finger crack on the face that angles up and right with not much for feet. 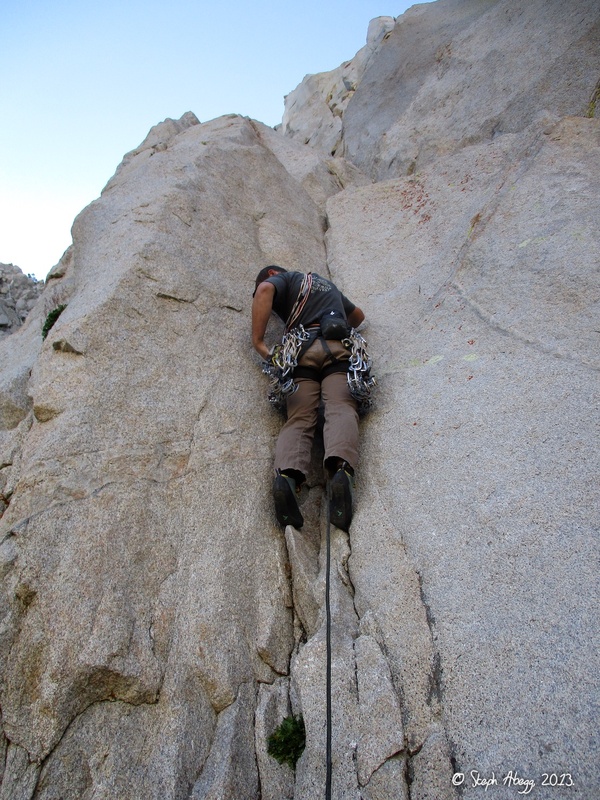 Climb back up and left into a steep thin hand crack around a block that leads to a ledge. 7. Brian leading Pitch 3 just above the initial corner. Here he is entering the finger crack system. 8. Taken just before the crux 5.10c finger crack section. This crack eats green and yellow aliens. Nice lead Brian! 9. The steep hands section wrapping around the left side of the block. Super fun. 10b. 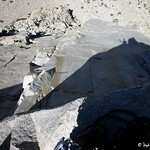 Climb an unlikely super thin flake directly above the belay to easier ground leading to just below the summit block. 10. 10. The thin flake at the start of Pitch 4. This protects well with 2 blue aliens. This section requires a bit of finesse. 4th. 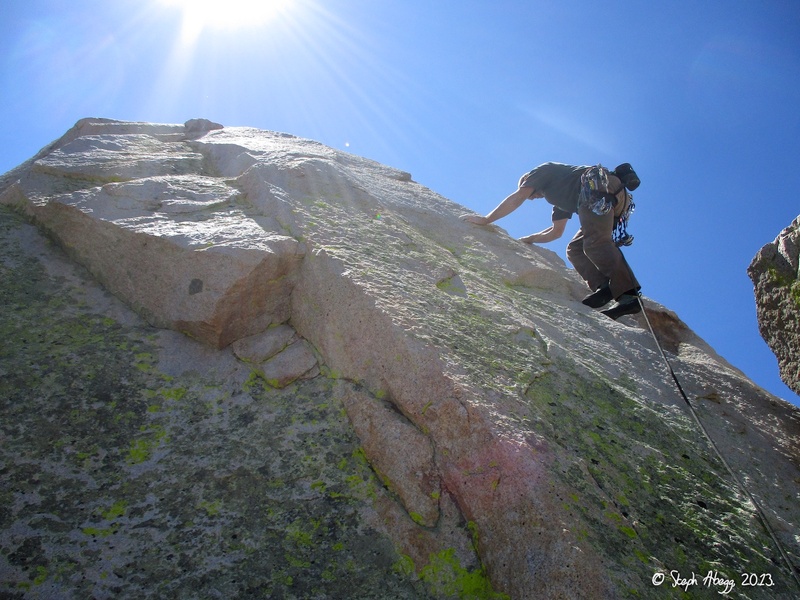 Climb to the top along the exposed and unprotectable summit ridge. 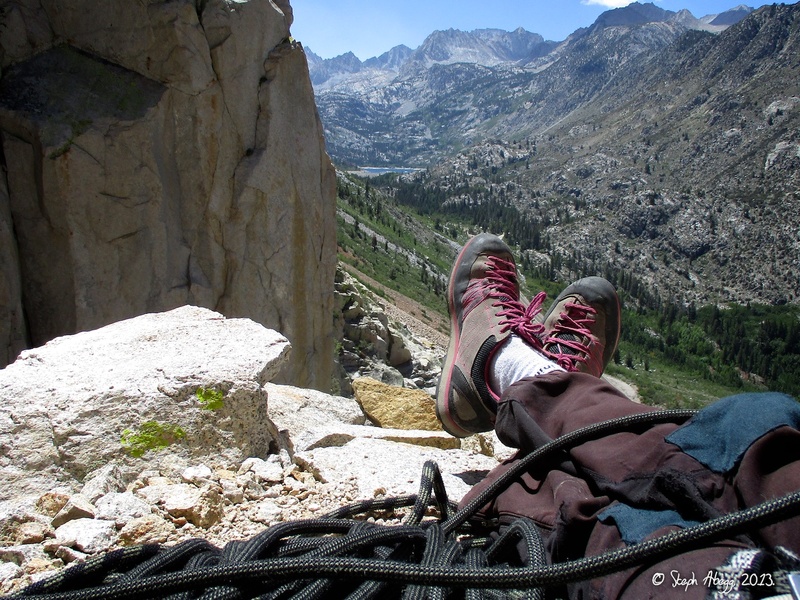 Enjoy the view and downclimb (or trust the old bolt to hold your weight). 11. 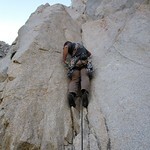 Brian climbing the exposed summit ridge. 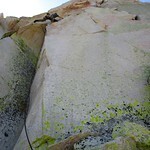 We both just climbed to the top on a belay, since there's no way to protect it besides for an old bolt at the top. 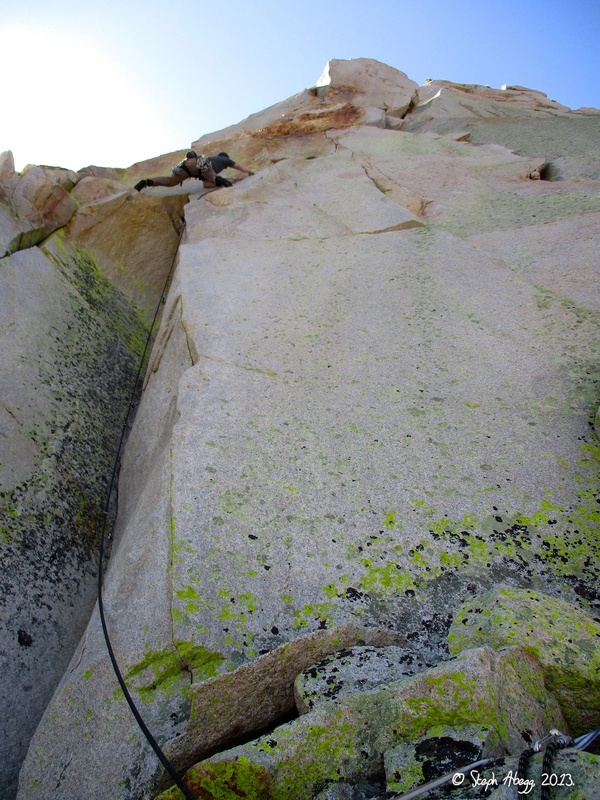 Most climbers who do the West Face route don't continue to the true summit (you cannot even see it from the top of the last pitch of the West Face), but Crack Kingdom puts you within eyesight of the top so you may as well tag the summit! 12. The top of Cardinal Pinnacle. Notice the old bolt. I don't think I'd want to lower off this. 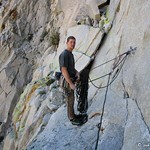 Might be okay to belay off of but it's not necessary to do so as you can climb up and down pretty easily. Descent From the top of Pitch 4, downclimb about 40 feet (5.5 but seemed more like 4th or 5.0) to the first proper rappel station on the exposed block at the top of the West Face. 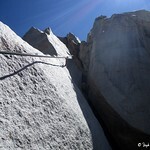 From here you have four 35 meter rappels (one 70m rope or two 50 or 60m ropes). 13. 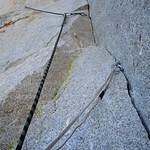 The 5.5 downclimb to the first set of rap anchors at the top of the West Face route. It seemed more like 4th or 5.0. 14. Looking down at the West Face from the top set of rap anchors. There were a couple of parties coming up. 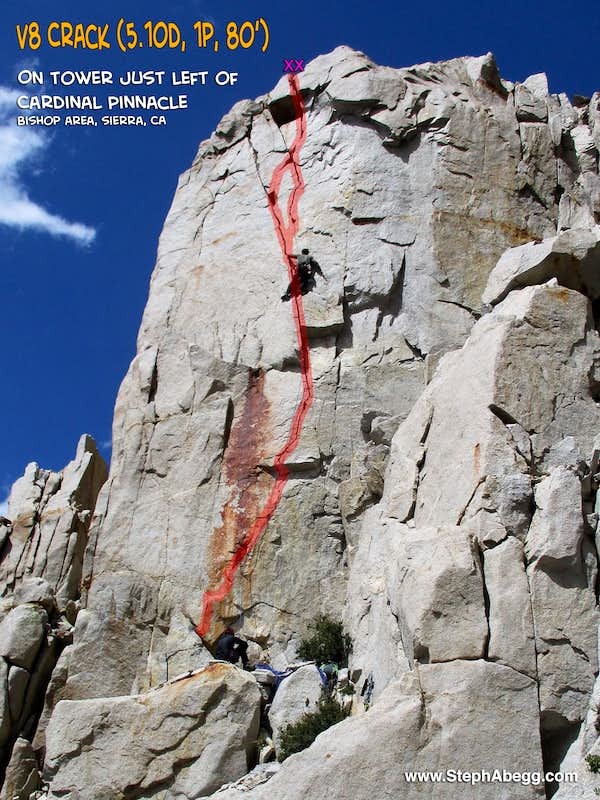 I climbed the West Face in 2013 (click link for trip report); the West Face is probably the most popular route on Cardinal, being the easiest (5.9 to 5.10a) route to the top and also full of high quality climbing. But I liked Crack Kingdom even better, both because of the increased challenge and the greater variety of the climbing on the route. 1. 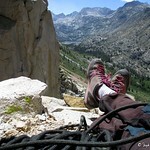 The view from the comfy belay ledge at the base of V8 Crack. Lake Sabrina in the distance. 2. 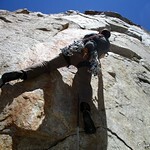 Brian leading off V8 Crack. Nice onsight lead Brian! 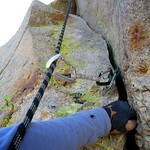 The 10d crux is about 15 feet of thin hands through small bulges and roofs. I have thin hands, so I personally found the crux to be pretty secure and found the wider hands section just above the thin hands to be a bit more difficult. The route was so good I couldn't resist running a lap on it.